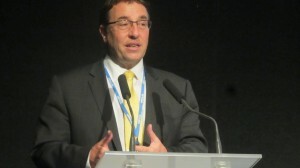 LIMA, Dec 13 2014 (IPS) - Africa is experiencing a revolution towards cleaner energy through renewable energy but the story has hardly been told to the world, says Achim Steiner, Executive Director of the United Nations Environment Programme (UNEP). Steiner, who had been advocating for renewable energy at the U.N. Climate Change Conference in Lima, said Africa is on the right path toward a low carbon footprint by tapping into its plentiful renewable resources – hydro, geothermal, solar and wind. “Kenya plans to triple its electricity generation up to about 6000 megawatts in the next five years. More than 90 percent of the planned power is to come from geothermal, solar and wind power,” he said. Kenya currently runs a geothermal power development corporation which invites tenders from private investors bid and is establishing a wind power firm likely to be the largest in Africa with a capacity of 350 megawatts of power under a public-private partnership. In Ethiopia, expansion of the Aluto-Langano geothermal power plant will increase geothermal generation capacity from the current 7 MW to 70 MW. The expansion project is being financed by the Ethiopian government (10 million dollars), a 12 million dollar grant from the Government of Japan, and a 13 million dollar loan from the World Bank. Phillip Hauser, Vice President of GDF Suez Energy Latin America, told IPS that geothermal power is a good option for countries in Africa with that potential, but it comes with risks. “It is very site-dependent. There can be geothermal projects that are relatively cost efficient and there are others that are relatively expensive. It is a bit like the oil and gas industry. You have to find the resource and you have to develop the resource. Sometimes you might drill and you don’t find anything – that is lost investment,” Hauser told IPS. Steiner admitted that like any other investment, renewable energy has some limitations, including the need for upfront initial capital and the cost of technology, but he said that countries with good renewable energy policies would attract the necessary private investments. “We are moving in a direction where Africa will not have to live in a global fuel market in which one day you have to pay 120 dollars for a barrel of crude oil, then the next day you get it at 80 dollars and before you know it, it is doubled,” he said. “So if you are in Africa and decide to exploit your wind, solar and geothermal resources, you will get yourself freedom from the global energy markets, and you will connect the majority of your people without waiting for thirty years until the power lines cross every corner of the country,”Steiner added. A recent assessment by the International Renewable Energy Agency (IRENA) of Africa’s renewable energy future found that solar and wind power potential existed in at least 21 countries, and biomass power potential in at least 14 countries. The agency, which supports countries in their transition to a sustainable energy future, has yet to provide a list of countries with geothermal power potential but almost all the countries around the Great Rift Valley in south-eastern Africa – Uganda, Ethiopia, Kenya and Tanzania among others – have already identified geothermal sites, with Kenya being the first to use a geothermal site to add power to its grid. 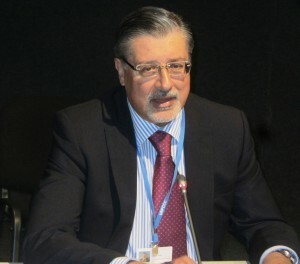 IRENA Director-General Adnan Z. Amin told IPS that the agency’s studies shows that not only can renewable energy meet the world’s rising demand, but it can do so more cheaply, while contributing to limiting global warming to under 2 degrees Celsius – the widely-cited tipping point in the climate change debate. He said the good news in Africa is that apart from the resources that exist, there is a growing body of knowledge across African expert institutions that would help the continent to exploit its virgin renewable energy potential. What is needed now, he explained, is for countries in Africa to develop the economic case for those resources supported by targeted government policies to help developers and financiers get projects off the ground. The IRENA assessment found that in 2010, African countries imported 18 billion dollars’ worth of oil – more than the entire amount they received in foreign aid – while oil subsidies in Africa cost an estimated 50 billion dollars every year. According to Amin, renewable energy technologies are now the most economical solution for off-grid and mini-grid electrification in remote areas, as well as for grid extension in some cases of centralised grid supply. He argued that rapid technological progress, combined with falling costs, a better understanding of financial risk and a growing appreciation of wider benefits mean that renewable energy would increasingly be the solution to Africa’s energy problem. In this context, Africa could take on new financing models that “de-risk” investments in order to lower the cost of capital, which has historically been a major barrier to investment in renewable energy, and one such model would include encouragement for green bonds. “Green bonds are the recent innovation for renewable energy investments,” said Amin. “Last year we reached about 14 billion dollars, this year there is an estimate of about 40 billion, and next year there is an estimate of about 100 billion dollars in green finance through green bonds. Why doesn’t Africa take advantage of those?” he asked. During the conference in Lima, activist groups have been urging an end to dependence on fossil fuel- and nuclear-powered energy systems, calling for investment and policies geared toward building clean, sustainable, community-based energy solutions. “We urgently need to decrease our energy consumption and push for a just transition to community-controlled renewable energy if we are to avoid devastating climate change,” said Susann Scherbarth, a climate justice and energy campaigner with Friends of the Earth Europe. He said policies that support feed-in tariffs and decentralized power sources should be embraced by both the most- and the least-developed nations. Backed by a new discussion paper on a ‘global renewable energy support programme’ from the What Next Forum, activists called for decentralised energy systems – including small-scale wind, solar, biomass mini-grids communities that are not necessarily connected to a national electricity transmission grid.